As reported by the Associated Press earlier this month, the state of New Mexico is rebranding itself to overcome a common perception of the state as boring. Thus, the “Land of Enchantment” will give way to “New Mexico True.” The move is hardly surprising when one looks back over the past century of statehood. For its entire history as a state, New Mexico promoters have walked a tightrope between accentuating the state’s exotic difference and claiming its place in the United States. Before statehood, the Santa Fe Railway’s tourism promotion arm, the Fred Harvey Company, created a powerful image of a foreign land filled with exotic peoples and stunning scenery. It packaged this experience through its Indian Department and its placement of Native American craftsmen and artists at rail stations along its tracks. In 1912, even as New Mexico achieved statehood, Santa Feans were working to enshrine “Pueblo Revival” as the motif for the state’s historic capital city, as historian Jay M. Price writes in his essay on Santa Fe in American Tourism. Adding to the focus on seeing the exotic “other,” which was common in tourism promotion and tourist expectations of the day, was a growing emphasis on actively engaging the state. The Santa Fe Railway inaugurated motorcar “Detours” in the 1920s to satisfy tourists’ urge to move beyond the confines of the railroad. As the golden age of the automotive vacation arrived, Route 66 provided an incentive to see New Mexico on one’s own time. 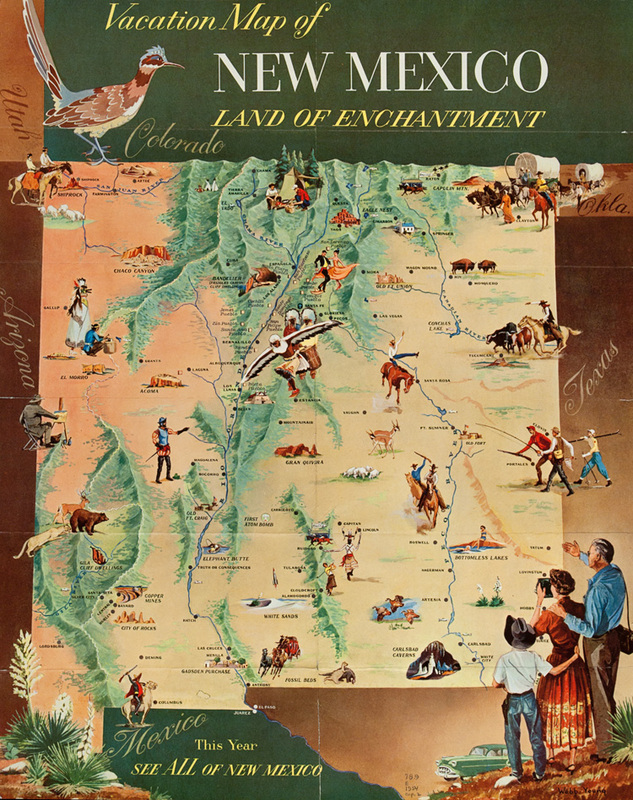 The colorful, cartoonish Vacation Map of New Mexico Land of Enchantment, published in 1954, is peopled with New Mexicans engaging in rugged work and tourists pursuing recreation. Thus, the new promotional focus on active travel actually taps a deep root. The term “Land of Enchantment,” according to the New Mexico Office of the State Historian, originally appeared in a 1906 book about the American Southwest and saw its first state-specific adoption by the state tourism office in the 1930s. Since 1941 it has appeared on all New Mexico license plates. Unfortunately, the contradiction inherent in early efforts to be seen as both “American” and a distant “land” paralleled the confusion that the word “Mexico” brought. Over time too many would-be tourists came to view New Mexico, a place that crafted an early image as “enchanting,” as empty and boring. How could such a colorful, exciting place lose its appeal? The tyranny of the Interstate Highway System, which can turn any of the Lower 48 into a monotonous experience to be endured rather than savored, surely plays some role in New Mexico. An arid and semi-arid landscape seen from the windshield of an automobile at 70 miles per hour on I-10 or I-40 removes the traveler from the enchantment of experiencing rugged terrain, unique architecture, or regional cultures. It seems timely that the state’s fresh look at promoting its image comes at a time when others are working to revive Route 66. Perhaps the most important truth in “New Mexico True” is that marketing of tourist destinations must evolve in order to maintain the enchantment.